Dario Argento, back in 1977, made murder beautiful. 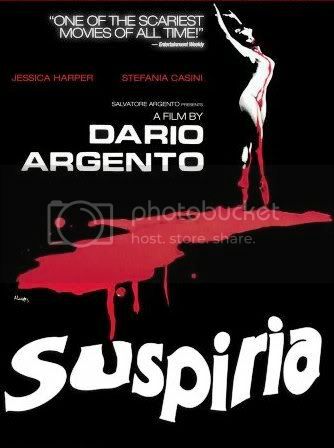 With his shockingly gorgeous giallo film Suspiria he set a high mark for art in horror films, a level which has not since been approached. The film varies between terrifying and entrancingly gorgeous, an odd and interesting combination. The opening sequence is evocative and atmospheric. A young lady named Suzy Bannion (Jessica Harper) disembarks at an airport and ventures through driving rain to find a taxi. She is mostly alone at the airport, walking down bright blue hallways. The camera moves slowly and lingers as she approaches the automatic door, then jarringly cuts to the door’s mechanism bursting open. Suzy takes the taxi to a ballet school, where a scared young woman is hurriedly leaving. Suzy tries to gain admittance but is denied: she is forced back into the taxi to find another place to stay for the night. Meanwhile, the scared girl runs through the woods in an amazingly lit scene where the car’s headlights are the only light source. This girl ventures to a friend’s house in the city where she is welcomed to stay. She stares out of the window into the dark, wind-swept evening. It seems like something may be waiting out there, but there is nothing. The music builds with the editing, then slows down just before a hand reaches out from the third story window and smashes her face. Eventually the young woman is stabbed numerous times before being suspended through a glass ceiling and hung in the middle of a beautiful room, a work of art dangling in an art museum. Cut back to Suzy, as she finally gains admittance into the school. She is shown around the place by the headmistress and dance instructress. There are a number of dance students studying there, many of whom also live on the premises. Suzy begins her classes, but soon begins to think that something might be amiss at the school. People are murdered or disappear at various intervals, and Suzy and her friend begin to hypothesize about what might be wrong. But Suzy is ill and kept in bed by Professor Verdegast (Renato Scarpa). His methods appear kindly on the surface, but he suffers from a certain degree of sinister creepiness. Eventually Suzy and her friend explore the grounds, finding out some disturbing secrets along the way. Suspiria may be one of the most beautiful films ever crafted. The colors are consistently vibrant and jarring, sometimes juxtaposed with opposing colors in the same frame. Everything seems either red, yellow, blue, green, or just black and white. But even the black and white is arranged so elegantly that it appears like an avant garde art museum. The set decoration and aesthetic is stunning, and anyone interested in interior decoration should watch the film if they can stomach the violent content. Argento understands the elements that craft an atmosphere of dread and unease. A year before Halloween he carefully hides murderous creatures in the shadows or a small part of the frame, trusting the audience’s eye to find it and discern the meaning. There are no obvious technical elements that tell viewers when to be scared and why. Instead, Argento uses subtle cues, both visual and auditory, to maintain the suspense. Small flashes of light, eyes in a dark shadow; these are the things that are terrifying. There are a great number of times when things are not as they should be. This sense of unfamiliarity and unpredictability is terrifying, drawing the audience in and engrossing them in the story. A seeing-eye dog, normally subdued and helpful, is mystically turned into a vicious beast. But when it is a small, blond, blue-eyed child, who could well have been a youthful Hitler, that is provoking the animal, who should be blamed for the attack? The soundtrack, primarily by Goblins, is classic. The theme music is almost as enduring as John Carpenter’s Halloween theme the next year, but much richer and deeper. Throughout the film the soundtrack is occasionally jarring and sometimes enchantingly calming. There are few problems with Suspiria, but they are ones that haunt a great many horror films. It doesn’t help that the dialogue is dubbed, in the tradition of most Italian films, making it hard to concentrate on the dialogue and the actors. There are a few cheesy moments, and the story and characters are a tad pulpy at times. But all of these elements, along the with paint-red blood, add to the charm and character of the movie. There is nothing terribly original or groundbreaking in the story or characters of Suspiria, but the aesthetic, the directing, the soundtrack, and the colors are simply genius and gorgeous. Seen properly (I would recommend an HD version if you can’t see a proper print of it) it is an experience that won’t be soon forgotten, a horror film that is terrifying and beautiful, atmospheric and colorful. A rare combination, and a must-see for fans of horror movies, or just beautiful films in general. This entry was posted in 3.5 pirate flags, 3.5 stars, Movie Reviews, Pirate Flag Rating, S, Star Rating on May 9, 2010 by Tim Irwin.